Please note this model is also referred to as the FR-101SD. 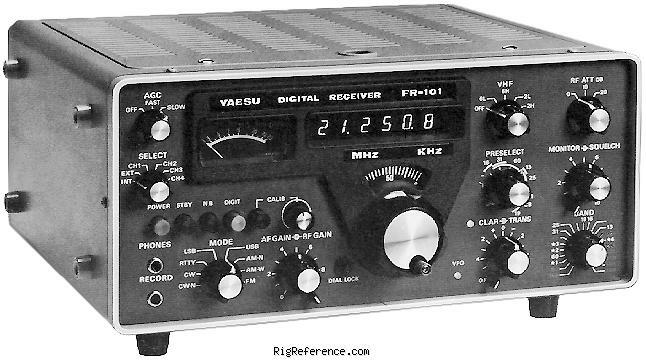 The Yaesu FR-101D is an amateur band receiver with provisions for multimode reception on twenty one 500 kHz amateur and shortwave bands from 160 to 10 meters. Two meters and six meter coverage is available by optional converters. This radio includes a stunning green digital display with analog subdial. Supplied frequency ranges include: 3.5-4, 7-7.5, 14-14.5, 21-21.5, 28-28.5, 28.5-29 MHz. It is designed to match the FL-101 transmitter through easy wiring. The FR-101D will also work with the FT-101/277E transceivers. Operation is from 100/110/117/200/220/234 VAC. Features include: attenuator, crystal calibrator, carry handle noise blanker, AGC OFF/SLOW/FAST, RF gain and squelch. The rear panel has SO239 antenna input and other I/O jacks. Estimating the value of a rig can be challenging. We collect prices paid by real hams over the years to help you estimate the current value of the Yaesu FR-101D. Just bought or sold this model? Let us know what you traded it for and help other ham operators!